As noted in today's Spoonflower email, we're going through a transition right now in our quilting-weight cotton. Starting this week we've printed all quilting-weight orders on cotton with a slightly different thread construction: 78×76 rather than the 60×60 we have used in the past. The decision to change our most popular base fabric is being driven by our determination to find a source for fabric with quality that is perfectly consistent from one batch to the next. Based on the testing we are doing right now to all our fabrics, we may well change again before we settle on a permanent replacement. 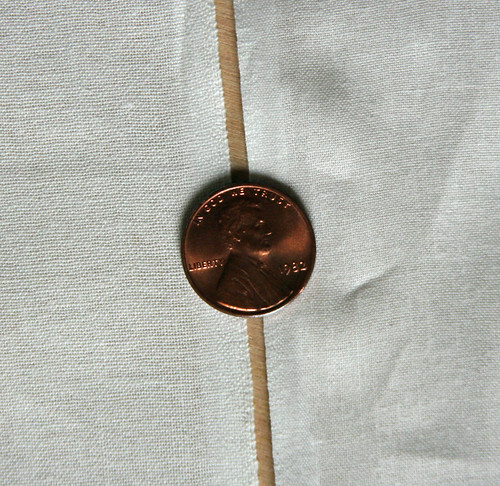 Above is a photo that shows the old quilting-weight cotton on the left and the new on the right. They're very similar in weight, but the new quilting cotton is slightly denser and softer than the old. Feedback on the change is welcome!